In the middle of tying preschoolers shoes, in the middle of cleaning babies' runny noses, in the middle of serving cooked cabbage to hungry staff, in the middle of folding towels, in the middle of painting pottery - He is there. It is in all of the "middle" moments through out my day, that I see Him clearer. I feel Him closer. I subconsciously came here with a "hero" mentality, like anyone would traveling to a third-world country. But that was turned right around, the first time one of the sweet childcare workers insisted on washing my feet. Yes, I came here to serve, but the way that my heart is being served at the James Place every day is far beyond any "rescuing" my "heroic" self could do. HEAL ministries is all about love, and I can vouch for the fact that it goes beyond the pictures on Instagram. I am forever thankful - for the relationships I've built at the James Place, and for a loving Father that meets us in the middle. I pray that I never forget about the middle moments in the day-to-day here; where the love is real and Jesus is near. Being a nurse is one of the greatest privileges and responsibilities I have ever known. As a nurse I end up in some of people’s most vulnerable and sometimes weakest moments. I get to “know” them in a way others won’t ever understand. Because of this I also get the opportunity to love them right where they are. Here at the James Place the woman and children are learning about a God that fully knows them, sees them, and loves them. It is a family that sees one another in vulnerable places in life and loves each other abundantly. It is a place where life may be difficult at times but we get through it together. Normally, you have to choose. You choose which sports to play. You choose who your friends will be. You choose if you are left or right brained… but not at The James Place. We are in the business of the ampersand, &. Many of the Ugandan mothers have not witnessed a healthy marriage or healthy parenting habits. Many grew up in orphanages and someone took a chance on them. They need someone to see them, to believe that they have something worth offering. They need tough love when they are out of line to show that someone cares enough about them to hold them accountable. They need someone to call out their strengths and give them leadership opportunities. At the James Place, we are truth and grace. We are hard talks and long hugs. HEAL has pulled women out of difficult (sometimes life threatening) situations, cared for them through abuse, and led them to the feet of Jesus where there is true healing. Children can grow up with the Ugandan curriculum & know how to critically think. Women can start off in an artisan program & later become full time staff. Mothers can have no idea how to raise children & have the space to rise to higher standards once they are at the James Place. Ampersand. If there were two words to describe the James Place, “second chances” would be up there. We believe in people. We empower them. We teach them how to be accountable for their actions & we give them second chances. Grace upon grace. We allow our employees to take out loans & they pay them back in a specific time frame. We have a discounted preschool and childcare program & they pay for their own children’s education. For me, ampersand is the ministry of Jesus. He is always offering us second chances and calling us higher. Fridays are my absolute favorite. Not because it is the last day of the week. Not because the weekend is here. Fridays are for worship and Bible Study. Every Friday every single person on the compound comes together to sing Praise to our Father. It is truly heavenly. The kids are dancing, jumping and raising their hands. The are silly but also passionate. The women have voices like angels and their love for the Lord is so evident. Fridays are also for fellowship. On Friday all the staff and interns eat in the same place celebrating the week and each other. After lunch volleyball is played and cheerleading for the players commences. It is such a special time each week. Fridays are for chores. After volleyball comes deep cleaning of the compound. To some that may sound awful, but I LOVE it. It is so neat to see all the staff work together to get all the tasks done and work alongside them. It truly takes a village to run the James Place and that is so clearly demonstrated during this time. Fridays are for feet washing. After chores all the staff wash their feet. They think we so poorly wash our feet that I have had my feet washed more times than I can count by them. It reminds me every time of Jesus humbly washing his disciples feet and loving them so intimately. I have experienced the most sacrificial love by the people here. The people at the James Place are amazing. They love with all they have got and then some. They care for one another in a way I have never experienced and truly are a family. We’ve all heard this saying as it relates to rearing children. We use it as we are carpooling to a soccer game or taking food to a family who lost a loved one. It’s parents bringing food to an after school event and kids sleeping over at a friend’s house when their parents are out of town. It takes a village. Never has this well known phrase come alive than during my time at the James Place. We have women here who have taken in children and raised them as their own. It might be a neighbor, a niece, or a child that their husband had with another woman. Often times, women send some of their children out to “the village” to be with their Jaja’s (grandmothers) because there are many children already living in their homes. The women at the James Place have become their own village. Because most are abandoned mamas, they only have each other. When they cannot come to work because they are sick, another woman will bring their child to school. When the money runs out, they borrow from their neighbors knowing that the shoe will be on the other foot in the future. And we have learned from them. As interns, we have joined this village. We are there to wipe each other’s tears and give each other a pat on the back for a job well done. We are there to care for one another when we are sick or broken hearted. Because that’s how we are made to live - in community, in a village. Where to even begin... The James Place holds such a special place in my heart and has been such a place of healing, joy, and spiritual growth for me. 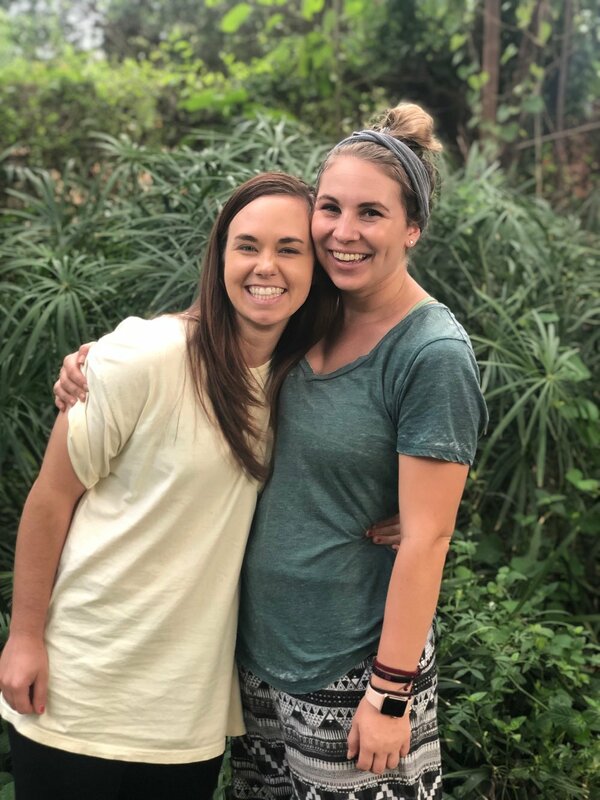 The women and children that HEAL Ministries serve are some of the most beautiful people (inside and out) that I have ever met and have taught me what it looks like to trust Jesus fully and live out my faith in day-to-day life. Their strength comes from the Lord alone, and thanks to this incredible place and their hard work and dedication, so many of these women and children are being empowered with trades, skills, and education so that they can truly “be the change” in the Jinja community and beyond! I am so blessed to be back for 6 months this time, after such a life-changing internship I had here last summer. I can’t say enough wonderful things about the James Place, but truly it is, in many ways, the way I believe heaven will look like one day. All hands on deck and all parts of the body of Christ being used to further the kingdom of God - one diaper, one meal, one student, one laugh, one woman’s dream of opening a business, one smile, one hug at a time! When I first came to the James Place just over four years ago, I didn't know what to expect. I didn't know how quickly I would fall in love with Uganda. I didn't know how deeply I would love the staff, women, and children who immediately became my family. I didn't know that there would be some extremely hard days, filled with loss and heartbreak, and that most days would be extremely beautiful, filled with joy, laughter, and fellowship. I didn't know that I would fall into the swing of missionary life, pouring my heart into those who would come for short periods of time, only having to say see you later’s too soon. I didn't know that I would soon come to call Jinja my home. Four years later, what I do know is that Jesus has been with me every step of the way, giving me the strength, energy, and endurance to fight the good fight. I know that He is present here and that He is working in powerful, mighty ways. I know that I love the people of HEAL Ministries with everything that I am. It breaks my heart having to leave them, to leave this place, to come to America. However, I know that for such a time as this, this is what my God is calling me to do. I know that this is what is best for everyone at HEAL Ministries, even if it means that my heart breaks a little bit in the process. I know that My God is strong; my God is mighty; and there is nothing that my God cannot do. There aren’t many places where you feel at home; where you feel safe and loved. Or at least I haven’t. I felt a sense of calm wash over me the second I walked through these gates and I knew that I was welcomed. The people here aren’t like ones I interact with every day. At home people keep their distance, keep their head down. Here, you are greeted with a smile and a warm wish that you might have a good day. Back home it seems like people want to get to know you, but the second they have to go out of their way to do so they drop their plan. Here, conversations and interactions mean something. People ask the smallest, most simple questions, not for small talk, but because they actually care. The love that binds us all together is shown here every day. For me the James Place has opened my eyes, while also fueling me to go live the life I desire back home. It’s places like these were you learn what really matters in life. And I am more than grateful that I was able to experience the magic of the James Place. The James Place is a haven for anyone and everyone. It is a safe place where community and love abound. Whether you are a widow, an orphan, or even visiting from another country, everyone is being healed by the power of God. Upon walking into the front gates, you instantly feel at home. You can always expect a genuine “Hello. How are you” from Dennis. The women here are indescribable. I knew that it would be easy to love on the babies, but I was not prepared for how much I would love these women. God knew that they would be a special surprise for me. The way they care for each other is selfless, humbling, and God-like. They lift each other up and they’re there for each other when another is down. The children are full of joy and life! They bring me back to my childlike faith and wonder. I see God in their eyes and in their smiles. Seeing them walk out of the gates with their little brother or sister on their backs makes my heart melt. They care for each other just as the women do. I was not prepared for all of the emotions I would experience by coming here, but I know I will never be the same. I pray that God will use everything I learned from the women and children (and can’t forget Dennis, Wilbur, and Noah :) to be poured out into the lives of everyone I meet. Walking into the HEAL Ministries gates feels like waking into a small piece of heaven on the other side of the world. This place is filled with amazing people, stories, different languages, rich culture, and filled with Jesus. What I love most about my time here is how strong and caring these women are toward one another. They are protective, resilient, smart, fierce, yet incredibly kind and nurturing. Even the small children are so good with helping care for their younger siblings. HEAL feels like experiencing what I would imagine living in a village might feel like. The people at HEAL protect each other, help raise each others babies, laugh together, play together, play volleyball together, and worship together. They also have a quiet strength about them. Grace, for example, is one of the women here and she has a baby named Malachi. She’s so kind and gentle, but I can see that if someone tried to hurt one of her babies, she would turn into one fierce mama bear! I love how these women walk through life supporting one another. I am incredibly grateful to have had the opportunity to be a part of HEAL Ministries, and I know I will be back someday soon. "Yet I am confident I will see the LORD's goodness while I am here in the land of the living." Psalm 27:13 I've seen His goodness in these red dirt roads, in the tea fields spreading for miles, in the spirit of thankfulness that always leads to praise, in generosity that showed me what it means to give with a cheerful heart, in servant-hearted thoughtfulness, in singing and dance that makes you laugh until you cry, in humility and vulnerability that shows a heart knelt down, in giggles and laughs you wish you could record as a forever hum in your head, in joy upon joy. I am undeserving of the goodness I've experienced. What Uganda & these friendships have been in my life is simply the story of the cross, of grace, of drowning in love, and undeserved kindness, of being told I have worth although I know I'm not worthy. God has a way of saying I know what you are, I know your darkest parts, but I love you still, I want you still. You are not worthy but you have unimaginable worth, you are worth everything to me- I would leave the 99 for you. I would call you to this place, this land of the living, because I love you, because I want to overflow your cup. I will use you because I want you to share in my glory, and I will use them because I want you to taste an earthly love that mirrors my heavenly love for you. Thank you the James Place, my mukwanos, my babies, and my kind Savior for 10 months of fullness. Hey guys, reporting live from Jinja. Fergie here. I’ve had the incredible opportunity to serve as a short term intern, long term intern, and am currently leading a team here at the James Place. The last time I was here in Jinja was three years ago and wow, how it has progressed. Walking through the gates felt like home, but I am still constantly blow away by all the positive change. Being here a week, I have already witnessed the tangible differences HEAL is making in this community. One of my favorite changes from last time I was here is seeing how many women from the artisan program have become James Place staff members. Being able to see their commitment to this community and willingness to work hard is a testament to the morals HEAL is instilling in each woman that walks through the gates. Another beautiful example of the power of a mother’s love is getting to see the moms and children from three years ago continuing living a sustainable, love-filled life together. The numbers are constantly increasing each day of women that enter the program and spend their days working towards providing for their family. These women have entered into a community of love and acceptance, and each one is an equally important part to the success of it. The James Place is all about cultivating relationships between women, volunteers, staff members, and the children, and it is a beautiful thing to be able to see the difference these relationships are making in the lives of people here. Jesus most certainly has laid his hand over this place. The James Place simply exudes Jesus. People walk by these gates and know that something different is happening inside. It’s an honor to be a small, small part of it because my experiences here truly transformed the way I think, live, and love. Morale is at an all time high. There is no better way to describe the James Place than these simple words, spoken by my friend Parvin, a young mother who works in the Artisan Department here as a master potter. Before I came to spend time working with HEAL, I really didn’t know what they did. People would ask me why I was going to Uganda and what I would be doing there, and honestly, I really didn’t know. All I knew is that I trusted the girls who had come here before me. So I packed my bags and flew half way around the world not really knowing what to expect. Upon arriving here in Jinja, I was informed as to what exactly HEAL’s focus is—keeping families together and orphan prevention. What HEAL does to meet this focus and keep it in check is a whole different story. Not only does the James Place run a preschool, but also a child care facility. It employs over 100 women in a variety of artisanal fields, provides a 3-year sewing curriculum and business classes that give single moms the opportunity to provide for themselves and their families. Women are welcome to come and participate in praise and worship and a Bible Study on Fridays, and kids from all of the villages (anywhere between 300-500 weekly) gather in the play yard for Kids Club every Saturday. This place is a well-oiled machine, which, through trial and error over the past 7 years, has become a sanctuary for women and their children to come and build a better life together. Those who have found themselves within the walls of the James Place know that no matter their situation, they can come and be loved here. It is safe, it is home, it is family. The James Place Preschool and day-care is a center where children are the first priority and above all Christ centered. - It has helped children to grow spiritually and morally upright. - The James Place Preschool has brought development in the community for example since it’s affordable; many parents are able to get their children education services. - The James Place Preschool has created employment opportunities to people in the community such as teachers, cooks, cleaners etc., and this has improved their families’ standard of living. - It has improved the nutrition of the children because of the balanced diet given at school. The children receive breakfast, lunch and two nutritional snacks. - It has helped children grow holistically and improved the children’s self-esteem. - It has given families hope and encouraged the community all around. We believe we are changing the next generation of Uganda and are beginning to break the cycle of poverty. Bear one another's burdens, and so fulfill the laws of Christ. During my first month in Jinja, another intern and I were invited to visit Masese, a slum in East Jinja where many of the women in the James Place Programs live. As we enjoyed some amazing brown rice and beans with a friend named Betty, a woman from the pottery department, a neighbor said a quick hello as she walked home from church with her grandson. 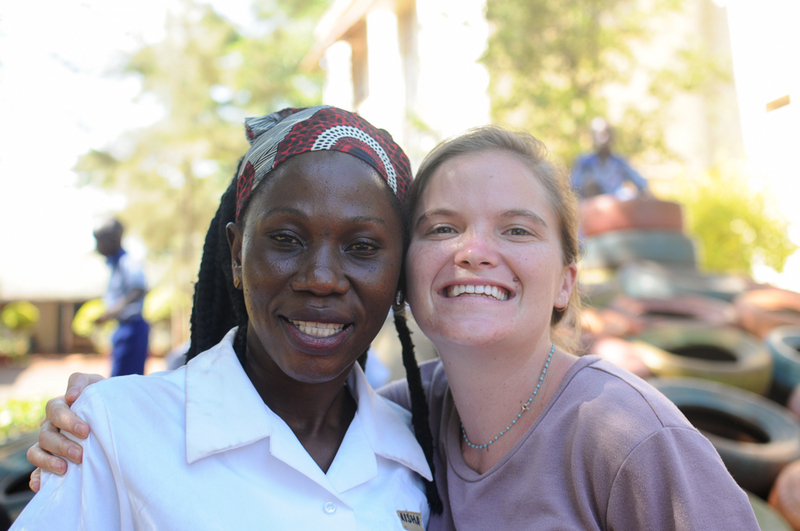 They exchanged a few quick words in Luganda as Betty gave her friend a plate of food to take home. We were blown away by her small but generous act of kindness. Even though she didn't have much, Betty shared what she had without question or complaint. In the past six months, I've seen the staff at the James Place care for each other constantly in big and small ways. I've seen them offer a hand with cleaning, feed each other's kids, take care of friends who are sick, and spur each other on to be better mothers, friends, and workers. I've been blown away by the kids and their overwhelming love for their siblings, friends, and caretakers. I have been the recipient of so much care and generosity from people who, from a material point of view, have little to offer. I have learned what it means to "bear one another's burdens". I am so grateful for the James Place because it provides jobs and income for women, it helps vulnerable families stay together by providing low cost childcare, and ministers to local children (among many other things). However, I believe one of the most important things the James Place provides is space. Space for true community where people love each other so much they bear each other's burdens. Space where Jesus can step in and make his power and glory known. My prayer for this place is that Jesus continues to be ever present in the relationships between staff, interns, women and children. I pray not only that their physical needs be met but that everyone who walks through our gates would see a glimpse of God's compassion and kindness. I pray that we interns and supporters may know how gracious God is to let us be a part of his redemptive work in this world. KIDS Club happens every Saturday from 2:00-5:00pm and is open to all community children. In the morning we have normal daycare for the children that come Monday- Friday, but then at 2pm the gates are opened for all children to come in! Kids usually line up for over an hour waiting to come in and play. From 2-3:00pm the children get an hour of free play in which they are able to swing, slide, play volleyball and football (soccer), run around and just be kids! HEAL staff and interns are spread out all over the compound to play with kids and supervise. The kids love this time, as it may be the only time they get to play with toys/ swings/ slides for the week. Here, in the first picture you can see kids all over running and playing! All the people in green shirts are the HEAL staff. Next- from 3:00-3:30pm we all gather in a large circle and have singing and dancing. This is my favorite part of KIDS club because the children absolutely light up and love to dance! There are a few teachers in the middle leading the songs and all the children join in! There are many songs that have dancing with a partner so we all grab an arm and dance around with the children. Then, from 3:30-3:45pm we have large group time where the teachers review the story from last week, talk about the story for this week and pray. Us interns are also responsible for a skit each week so we grab some kids from our program in the morning and make up a skit pertaining to the story each week. After large group, the children break up into smaller groups based on their age. Small groups happen from 3:45-4:25pm. This is where the teachers go through the story more in depth according to the age of the group. Each group is also dismissed to wash their hands during this time because each week they get clean water and a snack. We rotate between a roll, banana and boiled egg. After the small groups, we come back together at the end to review what the children have learned, sing a song and pray before they go home. This is what large group looks like! As each child leaves the gate they get a sweetie (lollipop) that has a verse based on the story attached to it. It is our hope the children read the scripture during the week and share it with their family. All the HEAL staff and interns also make a “tunnel of love” as the children leave and rotate saying different phrases like “Jesus loves you,” “See you next week,” “We love you so much,” and a couple Luganda sayings. Each child leaves loved, fed and knowing more about Christ. I see so much value in KIDS Club. These kids are taught about Jesus every single week. The teachers do a great job at making the lessons age appropriate and fun for the kids to learn from. They also see joy and loved lived out by our staff and interns each week. KIDS Club may be a highlight for some of these kids each week, and that is an honor that we do not take lightly. This is also a time for kids to just be kids. Children here have so much responsibility at home and are usually forced to grow up very quickly, but for these three hours each week all they have to do is have fun and learn about Jesus! I am so thankful that HEAL Ministries continues to pour into the children in surroundings villages and it is just one of the reasons I love being a part of the team here in Jinja! The James Place. When I begin to imagine how to describe what this place embodies, two words come to mind. The first word is joy, a joy that I have never seen before, a joy that I didn't know could be attained, a joy that fills every human being that ever steps foot onto this compound. When you experience women and children that come from nothing, you begin to further understand what it means to have true joy; to have a joy that is not controlled by success or circumstances but a joy that is affected by one thing. Jesus. Their joyful spirits are not rooted in their image but rather rooted in the joyfulness of being alive, having another living breathing day on this earth. That is true joy. The second characteristic that screams out to me when I think of the James Place is love. Try and imagine this for a minute. You are twenty years old, in a completely foreign country, definitely jet-lagged, and wondering why God called you here. You wake up your first morning in Uganda and you head over to a place you've been picturing and imagining for weeks. You step onto the red tinted dirt and immediately are flooded with beautiful children. These children immediately love you without any conditions. They love you because you're a new friend to play with, or because you have long blonde hair that they can learn to braid, or because you will push them on the swing for an hour, or give them kisses in the morning when you arrive. These kids love you without any conditions and it doesn't stop with the children. It weaves its way throughout the entire community of the James Place, through every staff member and every child I have experienced; what the Bible describes as unconditional love. A love that meets you where you're at, a love that doesn’t expect anything from you, a love without conditions. A place that captures your heart within seconds. A place that sees a need and meets it. A place that embodies Jesus through the joy and love given and received day in and day out. The James Place is a special place. I had no idea what to expect when I stepped off of the plane in the Entebbe airport. This would be my first trip to Uganda, my first time with HEAL Ministries, and I was relying solely on my faith and trust in the Lord to calm my nerves that night. Arriving at the James Place, I was met with far more love and grace than a college student from Arkansas could ever be worthy of and could ever hope to repay. I began serving in the preschool, and my heart melted each time I heard a child call me "Teacher Kaylee." I cherished each lightbulb moment that occurred; even though they called me teacher, I was constantly learning new things from them. We must serve a big, sovereign God if He could allow our paths to cross here at the James Place, blessing me with the opportunity to know and grow with these children for a time. I feel the Lord's presence so strongly on these grounds and in the classroom at the James Place, and I am so thankful to have had the opportunity to be Teacher Kaylee for the past two months. God is so good! When I pause to think about my time at the James Place, when I think of the memories I've gained, the lessons I've learned, and the people I've met; the word that seems to come to mind most often is generosity. When most think of generosity, they think of it in terms of money or material items, but this summer I've seen the depth of variety that the word can actually hold. I've seen generous community being given by and received between staff, children, and women in the program... they truly just do life together, all the messy, joyful, true, and raw moments of life. No one who enters the gates of the James Place has to do life alone because everyone here is ready and willing to give their time, energy, and love to make sure that person knows how loved and special they are. It's evident that the environment of generosity that I have witnessed here comes from the Father of giving; His spirit is sown throughout each aspect of the programs here. I'm so very thankful to have experienced each moment of generosity this summer. Every joyful hug from a sweet child, every sweet story of how God has changed their life from a woman, every opportunity to learn from my sweet friends in the social work department, every home I've been welcomed into; I've seen the generous grace, love, & mercy of the Lord. 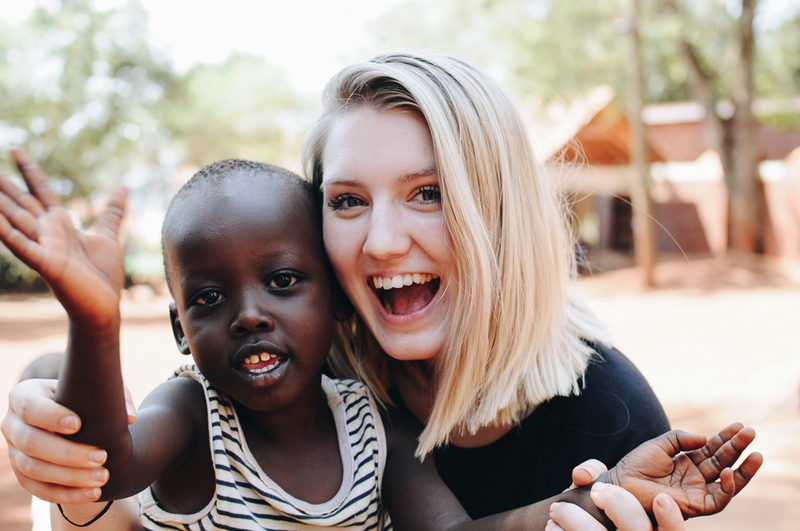 Many things come into my mind when I think about a way to wrap up my experience here in Uganda in just one paragraph, but one word that comes to mind is love. It is all around me. It is in the "Good mornings" I yell out to Fortunate and Dennis after a morning run, it is in washing diapers at chores times, making necklaces in jewelry even with a language barrier that is so real, and it is even in the love I have for rice and beans that I never knew was possible. I am eternally thankful for this time. I feel like God knew what He was doing when he placed me here for this month when some things in my life are so unknown at home with college decisions. He gave me something steady, He gave me people who loved me for just me. The love is around me when the kid's faces light up at us carrying them to nap time or reading stories at story time. Every day I have sweet baby Jacob grabbing my hand at 5:00 for story time and it fills my heart. I know it is overused to say "these kids have shaped me more than I have them" but I can't think of anything more true. Even when the days seem repetitive, a special moment touches my heart each day in the kids smiles even if it's with a simple dance party with a beat being made from the tub we keep toys in. These children are a light in my life. A reason I signed up for this internship is that I wanted to be around the children and how I am oh so thankful for them, but it is so amazingly interesting how the women have shaped my time here heavily throughout chore time. In chore time we interns are often washing diapers, socks, wash clothes, toys or uniforms and it is FUN. The first day I did chores I was not happy at all to have to do them every day, but oh how that has changed I love chores. I never understand the Lugandan they are speaking back and forth to each other, but I do understand the laughs they share. We see the women laughing all with each other and it makes me smiles just to see them smile. Chores have also been a time for me to get to really sit and get to know the women better, so without chore time I think I would have missed many relationships that have changed my time here. Even if it is rinsing the toys while Sylvia cleans, I am happy to just be sitting with her. I never imagined chore time being an integral part of my time here, but it blessed me to be able to bond with these women in childcare even when I'm scrubbing away at dirty socks.